The View from Aristeia: Effective Modern C++ Exists! I arrived in Berlin last night (where I'm participating in Meeting C++) to find a package waiting for me with two print copies of EMC++! At about the same time, I found out that the initial print run had sold out by the time it hit the warehouse, so a second printing has been scheduled in about a week. If you didn't get a copy of the book from the initial print run, don't feel bad: the books I ordered for some training I'll be doing next week got pushed back to the second printing, too. The only copies I'll see for a while are the two you see in the picture. 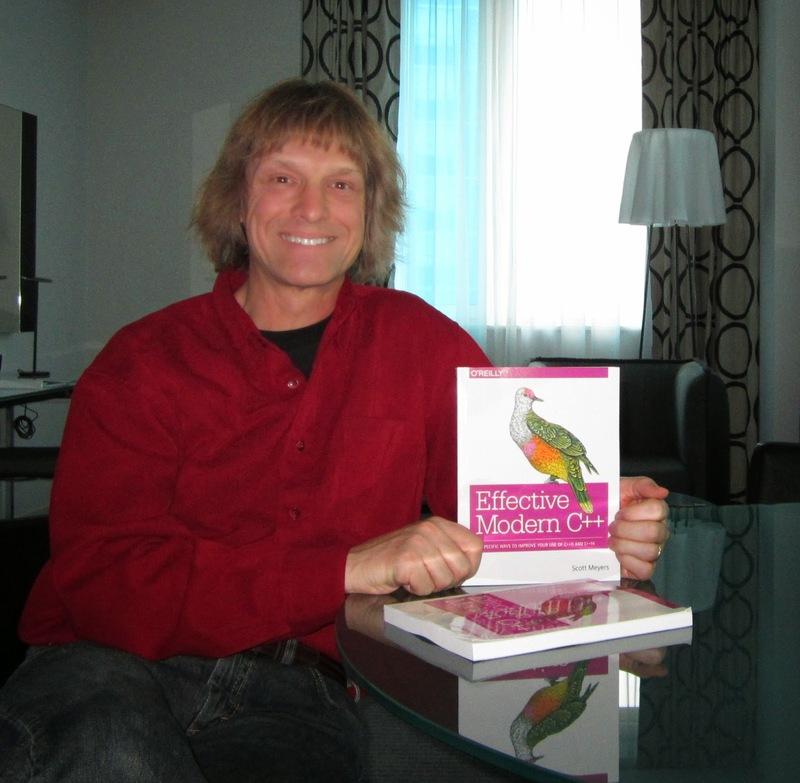 In the meantime, Addison-Wesley has extended their deep ebook Deal of the Day discount on the digital versions of my earlier C++ books to a second day, so if you're wondering what to do while you're waiting for your print copy of EMC++ to arrive, don't overlook the possibility of clicking and shopping for EC++, MEC++, and ESTL. Just got the predicted delivery date from Amazon today, so halfway through December I should be munching on some new bytes. BTW, did you go as He-man for Halloween? Because that picture of you with the books looks like him more than ever! @Anonymous: Hey, I'm still not blonde! Congratulations! Is it the first book from O'Reilly to have a color picture on the cover? @hackworks: No, there are others. Congrats! A beautifully written set of guides (I keep the e-version even on my phone). Congrats with your book, Scott! Congrats, Scott! FYI: Unfortunately, amazon.de postponed the delivery date from 8th December to unknown for my September order. @Anonymous: I suspect this has to do with how O'Reilly apportioned the print books when they were delivered to the warehouse. I have no insight into that process, sorry, and I apologize for the delay you're experiencing. Delivery date was due on the 17th of december in the UK, then Amazon sent an email where odly the first sentence was "we've got some good news! ", before informing me the book is now due on the 5th of Jan.. Maybe trying to save my holidays from an addictive read? Anyways looking forward to it. btw, why does it still says "early release" at a ebook cover? Is it going to be updated? It also shows line numbers (not only for code snippets) at all pages. Can we have one without them at some point? @Ilya S.: The "early release" and line numbers should both be gone--neither are part of the final release. Can you tell me where you're seeing them? I received my dead-tree edition yesterday from amazon-US. Woo hoo! Scott, it seems like this was a matter of hours. There was early release edition when I downloaded pdf just after purchase earlier this day and now there is a final version. @Ilya S.: I'm glad to hear that things got cleared up. Thanks for letting me (and everybody else) know. @Boris Dušek: I'm told my book is available at the iBooks store here. @Scott Meyers: apparently they did publish it in the US iBooks Store, but have not published it in the Czech iBooks Store (that's where I am) – that's what iBooks is telling me after hitting the link you provided. As all previous 3 books are available in the Czech iBooks Store, could you please ask O'Reilly to make this one available in the Czech iBooks Store as well? And perhaps Czech Republic is not the only country omitted. Thanks. @Boris Dušek: I've forwarded this new query to O'Reilly, and again I'll let you know what I find out. Are you aware that your book is freely available here as an ebook? This is the third result in google's search. Is it intentional or a mistake? It looks like this is not a prerelease. @Gábor Márton: There are no legal copies of the book that are freely available. Thanks for reporting the illegal copy you found. I've forwarded the information to O'Reilly. O'Reilly is still working out details of a relationship with the Czech version of the iBooks store. I'm not able to give an estimate of when those negotiations will conclude. That's all I know, sorry. @Scott Meyers: OK, thanks for the update, I will keep my fingers crossed. Just FYI, I checked that the book is also not available on the German and UK iBooks Stores; so I would guess it's available only in the US iBooks Store.